This is an important book which has not yet had the attention it deserves. Mark Hayes’ purpose is to write against an academic consensus which increasingly tends to separate the actions of fascism (i.e. what fascist parties did in history) from the analysis of fascism by political scientists. Amongst the former, there is (at least in Britain and the US) as much of an anti-fascist consensus as there has ever been. Within political science by contrast, there is a tendency to treat fascism as a set of ideas isolated from their consequences. The first part of Hayes’ book explores the ideological components of fascism; the first chapter insists on fascism’s essential irrationality. Deeply rooted in the collective psyche of post-1918 Europe were desires to escape from a world of rationality, to return to what were said to be deeper instincts of lust, wilfulness and discipline. Thus when talking about fascism’s ideas (nationalism, authoritarian leadership, anti-communism, racism, etc), a writer cannot simply repeated fascist commonplaces (such as the common slogan: “fascism equals nationalism plus socialism” or “fascism is neither right nor left”) but understand that the terms within the equation have taken on a charged and different content. Fascists did not share the same political vocabulary opponents, or, to the limited extent that they did, they took the terms and gave them a new meaning. 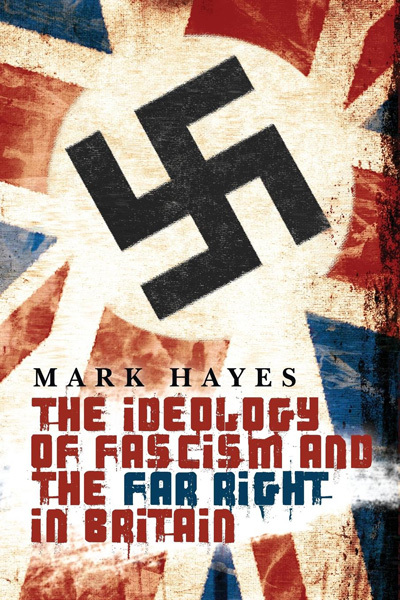 The second part of Hayes’ book is devoted to British fascism, and while much of the material on pre-1979 fascism is familiar, Hayes account of the factional intrigues within the post-1979 National Front, and from there through “Rights for Whites” to Nick Griffin’s decisions first to join the BNP and then stand for its leadership, is more specific and compelling than anything else I have read on this period. Some minor criticisms could be made. Hayes himself is a former supporter of Red Action and Anti-Fascist Action (AFA), and argues very briefly in the final pages of his book that in an era of neo-liberal hegemony and declining trade union membership AFA was an important instance not just of successful anti-fascism but also of the engagement and mobilisation of working class people. I have argued elsewhere that a positive balance sheet could be drawn up with regards to several previous waves of anti-fascist activism: by the Anti-Nazi League in the late 1970s, by the 43 Group in 1945-1951, and by the Communists in the 1930s. It is a shame that the parts of Hayes’ book which are devoted to British fascism before 1979 do not also show how fascist tactics have been repeatedly changed out of all recognition in response to anti-fascist campaigns. At the level of the greatest abstraction, I think Hayes takes a wrong turn in formally emphasising fascist “function” without giving equal weight to fascist methods of organisation. David Cameron, Nigel Farage, Boris Johnson and their many predecessors have wanted to bolster the rule of existing social elites. The point at which fascists diverged from them was in the leadership principle, their use of security teams (or in the case of the British Union of Fascists, a private army in embryo), and their willingness to use extra Parliamentary methods including a presence in the streets as the means to achieve their end. The context in which anti-fascism has historically operated has been set by the contradictions between fascist goals and fascist methods. That is why, for example, Communist tactics at Olympia in 1934 were effective, because they brought out – before Mosley’s Conservative audience – the reality that behind the high-seeming appeals to civic patriotism the fascists practised the method of the iron fist. I am not sure whether Hayes sees the present period as one in which fascists could grow – there are a number of passages where he talks about what fascism “was/is”. If, as I suspect, he thinks we are still, to an extent, in an age pregnant with fascism, then I would have like to have seen that argued directly. That said, I found myself agreeing with more of this book than anything similar to it published in the last decade. I enjoyed it and I hope it receives the widest possible readership. It may be worth pointing out that the Public Order Act which banned private armies came a full two years after Olympia, in response to Cable Street – what really worried the government wasn’t (limited and tightly-controlled) Fascist violence but the spectre of mass anti-Fascist counter-violence. But this isn’t to say that Communist tactics at Olympia weren’t effective – they certainly raised awareness of the Fascist threat. I really can’t see fascism gaining traction in the foreseeable future in this country. Surely one of the key elements of fascism is the actual (or preceived?) threat to capitalism from a well organised and militant working class. Sadly, this is hardly the case in 2014 Britain. The ruling class is pretty comfortable, isn’t it?